Hi, my name is Carla, I´m 46 and silver. The Right Hairstyles Magazine has posted a couple of empowering gray hair stories and I also want to share my journey, which was epic. Moreover, I learned LOTS of useful tips, especially for readers who don’t know where to start their transition. 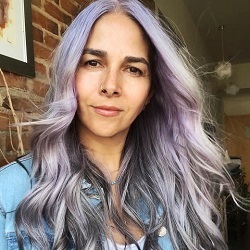 I started going gray at 14 years old; my first silver hairs were on the sides of my head and, through the years, they became more and more noticeable. In 2013, I really considered letting my natural gray hair grow. I looked for inspiration on the Internet because wanted to see real young women with natural silver hair. There was not much out there — just a couple of pictures of Sarah Harris that I found, and I loved her look — she had long silver hair and still looked cool. My husband has been my biggest supporter. Since getting married in 2005, he told me to go gray, but I was so scared of looking like his mother; he’s five years younger than I, so that was my main concern. I knew that going cold turkey was not going to be the best thing to do. I had dark brown hair and, from what I could see, my roots were pretty white. I decided that bleaching was going to be an easier transition, and I also wanted to maintain my long hair — a couple of inches below my shoulders. I researched a lot about bleaching hair at home, but decided to go to a professional, instead. When I told my stylist what I wanted to do, her face was a bit skeptic, but, at the same time, she was challenged by the task. She started the process: After a couple of hours, she washed my hair, and it was orange; after another bleaching, a couple of hours later, my hair was light yellow but completely damaged; it started to break and had a gummy texture—she then told me she had to cut it. I knew that was a possibility, so she cut my hair in a bob and used purple shampoo to tone it and told me that I should not wash my hair for a week and return for another bleach. After a horrible week of not washing my hair, not recognizing myself in the mirror, she did another round of bleach and I then had gray hair. That was my last dye job, well at least my last permanent dye. The gray faded in a week and I was left with light yellow hair, which I would tone by myself. I had done some online research and found that you can tone your hair only shampoo made for silver hair. I bought Shimmer Lights from Clairol. According to the bottle’s directions, you just have to dampen your hair and put some purple shampoo in. Then, you leave it in your hair for five minutes, as if it was hair dye, and then wash it off, which then leaves my hair a grayish color. If you want to try it, just be careful with how long you leave the Shimmer Lights shampoo in your hair because it can turn your locks purple. After a couple of months, I decided to play with color. I’ve already had bleached hair, so I decided to use Manic Panic — bought one in Purple Haze — so, I use white conditioner and Manic Panic. I normally use a spoon of Manic Panic plus enough conditioner to cover my hair. You put the mix in your hair and leave it on for at least an hour and then wash it. Manic Panic is a semi-permanent hair dye and won’t damage your hair. The color fades with every wash and, in my experience. it lasts around 10 washes. Shimmer Lights is a great shampoo. I can use it every day, and it won’t turn my hair purple. Shiny Silver, which you have to use daily because it is not that pigmented. L’Oreal Professionnel Serie Expert Silver Shampoo has a lot of pigment. Dessange Âge Sublime Blanc Chic has a lot of pigment so I don’t have to use it daily. I love playing with my hair — it is naturally straight, so making curls is my favorite hairstyle. I let my hair air dry and then I use a flat iron or a curler. To protect my hair, I rub a couple of drops of argan oil in my hands to get it warm and then apply it to my hair, usually from mid-length to my ends. There are two brands I’ve tried, and both are really good. One N’ Only Argan Oil helps to protect hair from heat and also as a hair treatment. Proclaim Argan Oil is also my favorite. By the way, I love applying argan oil on my skin, too. At least once a week, to keep it healthy, I put argan oil in my hair, put it in a high bun and sleep on it that way. I use around four drops or more, rub it in my hands to get it warm and then put it in my hair avoiding the scalp. I brush my hair so it gets more even. Then, the next day I wash my hair, and it help keep my ends healthy. I´ve used coconut oil the same way, and it also helps, but I do prefer to use argan oil. I get lots of compliments on my hair — it is healthy, shiny and grows so fast, all of the things my hair missed while I used to dye it. Having gray hair is part of aging. For some of us, looking older comes earlier in life. People still think I dye my hair silver, and when I tell them that this is my natural hair, they can’t believe it. Having gray hair doesn’t mean you will look old, it’s all in your attitude. I love my hair and how it makes me unique. Follow me on Instagram because I post my daily hairstyles and important thoughts there.